"Battletoads & Double Dragon: The Ultimate Team is a 1993 beat 'em up developed by Rare and published by Tradewest. It was originally released for the NES and later ported to the Sega Mega Drive/Genesis, Super NES, and Game Boy. The Ultimate Team is a crossover of both Technos Japan's Double Dragon and Rare's own Battletoads game franchises, although Technos had little or no credited involvement in the production of the game outside of the Double Dragon license. The game features the characters from the Double Dragon series, Billy and Jimmy Lee, two young martial arts experts. Also included are the three humanoid toad protagonists from the Battletoads game. Some of the enemies are from the Battletoads and Double Dragon games, while others are original. The game's engine and design are directly based upon the Battletoads series. After being defeated by the Battletoads, the humiliated Dark Queen flees to the outer reaches of the universe. The 'Toads and their mentor get on with their lives. However, one day the Earth's military is neutralized and a giant spaceship called Colossus emerges from the moon. Apparently, the Dark Queen is back in another plan to dominate the galaxy, and she has allied herself with the Shadow Warriors (from the Double Dragon series) to supplement her forces. Deciding to even the odds, the Battletoads get in contact with Billy and Jimmy Lee and asks them for their help. The brothers agree, and all five immediately take off for the Colossus in a mission to stop this two-pronged threat. The player has a choice of five playable characters: Billy and Jimmy Lee (from Double Dragon), and Zitz, Pimple and Rash from Battletoads. The player must then proceed through seven stages, kicking and punching each enemy that comes onscreen. A boss is included at the end of each stage, challenging the player before they can progress to a higher level of the game. With two players, the continues are overlapping. Whenever one player continues, then both players have to start at the beginning of the level. This is the opposite of games like Contra, where a strong player can tow a weak player along to advanced levels. In Battletoads & Double Dragon, a weak player will hold a strong player back. 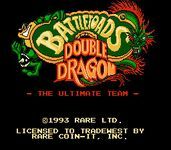 Source: Wikipedia, "Battle_Toads_&_Double_Dragon," available under the CC-BY-SA License.